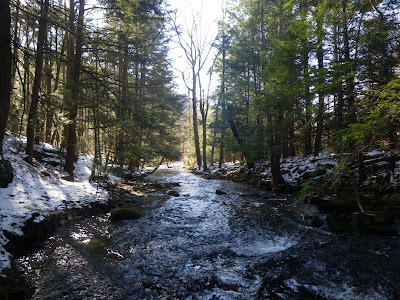 This River is Wild: A Winter Outing. It a typical winter morning in Pennsylvania. Cold, brisk air meets you as you step out of your car. 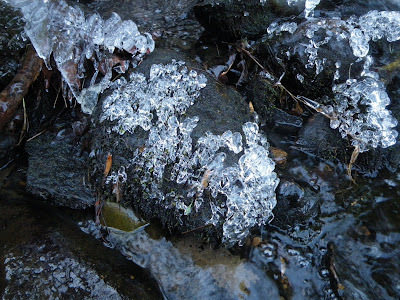 The frost and ice crunches under your boots as you make your way to the destination. You pass under evergreens with patches of untouched earth beneath their enormous spreads and down to the stream. Low, clear, and frigid, the water meanders over rocks, gravel, and slate gradually descending in elevation before reaching it's confluence. 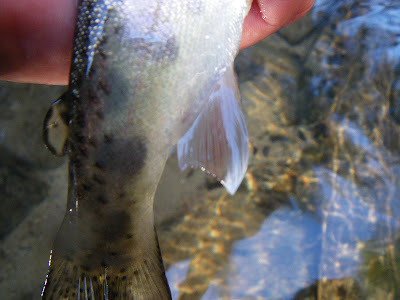 The larger tailwater, heavily pressured, presents a stark contrast to its much smaller neighbor. Up the Chutes, Along the Thorn Bushes, & Around the Boulder. 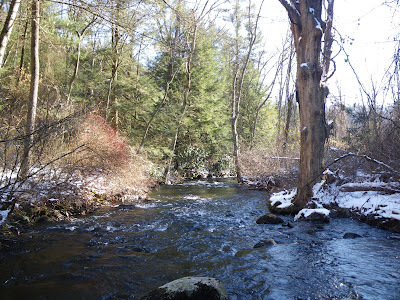 I am here with the goal of walking upstream to fish new water, that I never quite reached before. As I begin making my way to the particular stretch in mind, I decide to fish along the way. 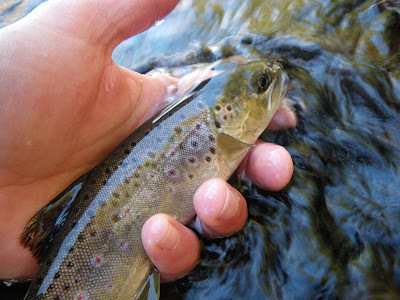 A few trout later, and I am walking up the creek instead of on the much faster path. 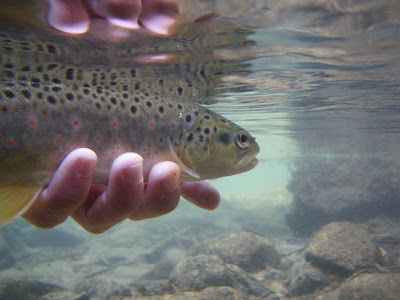 I am unable to escape the lure of familiar water and eager trout. Sandy Bottom = Sandy Looking Brown. 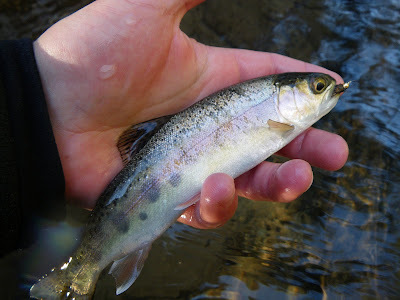 Small Rainbow, Out of his Place. 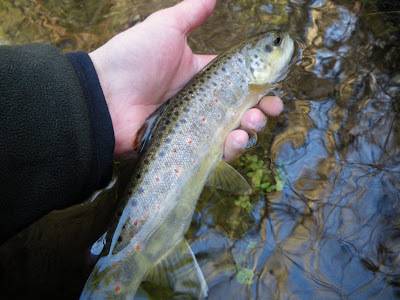 Made His Way From the Tailwater. One of the larger holes presents a few surprises. Usually I can guarantee an instantaneous hook up but I am shut out on my first several cast. Rather than stay the course, I change positions and add some distance to the attempt. 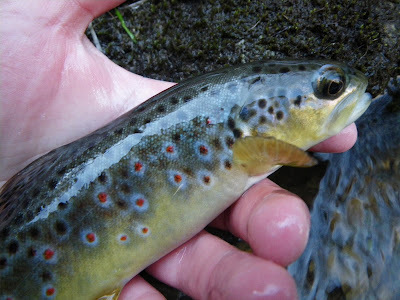 A long side arm cast up stream and the soft hackle hares ear lands along a swift current. I mend my slack line out of the torrent and into the eddy slowing my drift considerably. 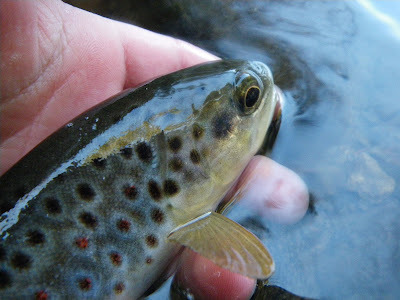 I wait a few moments before on cue, just when the fly reaches the sweet spot, the indicator jolts, and a the nicest brown of the day comes to hand. Little Guy Getting in On Some Action. Watch Your Step or Take a Spill. 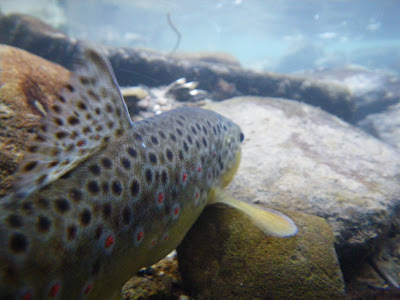 At this moment in time, I am well behind schedule, rather than fishing the new water, I find myself power fishing a way too familiar haunt and time is running out. The sun is disappearing behind the trees, casting a cold shadow on the small stream. The temperature drops and I find my guides accumulating ice and my reel freezing solid on much quicker intervals. My poor toes, already numb, are an afterthought compared to my pointer finger. 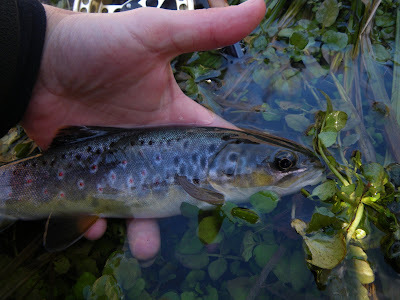 I day spent constantly being rewetted by a fly line and dipped into water is beginning to take its toll. I am beginning to worry about it. 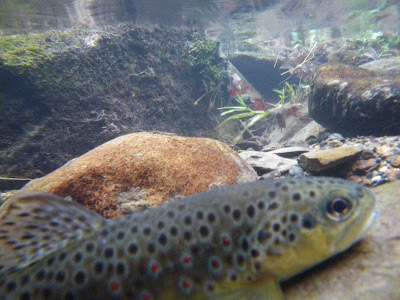 I press on and finally reach the unblemished plateau of new water and new fish. I have little more than an hour of visible light to work with, so I choose carefully. I find a short deep trough perfectly protected by a massive downed maple, thorn bushes, and overhanging branches at eye level. It looks promising, and despite its bodyguards it beckons me to give it a go. I crouch low and sling shot a cast into an area the size of a shopping cart before lifting and mending line over some debris. 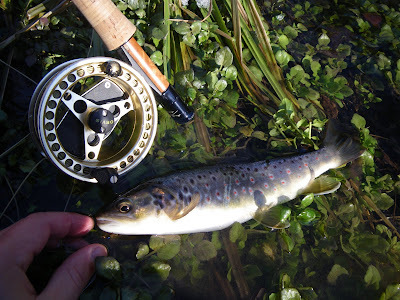 After a few feet of drift, the indicator takes a plunge and I tie into a nice brown. A few head shakes and my de-barbed hares ear sky rockets into the overhanging branches creating a new nesting area for the local wildlife. I curse the temptation of the hole and the premeditated result of my foolishness. I carefully work my line up, under, and around branches before, CHING, the size 14 hook lashes on for good. Well, there goes that fly. Freshly tied and promptly broken in by a days fishing, I get antsy and break it off. It tumbles into about a foot of cold water, clearly visible and peeking at me from in between gravel. I contemplate long an hard my next move. 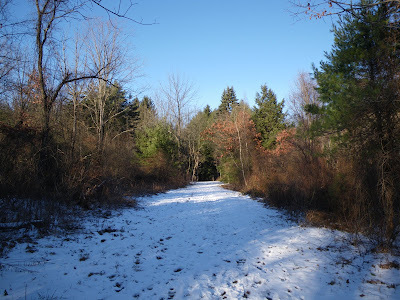 Reach my already frozen and soaked arm into the cold and grab it, or say goodbye and pack it in for good?Retie a fresh rig of 6x in twenty degrees with no feeling in hands, feet, or face or reel in and take a nature walk back to the truck? I swallow my pride, perfectly content with my experience, and my fingers before walking the long lonely trail back to the parking lot. Nice. A little hope for those of us not lucky enough to get out...for the last two months. I wish I could say this post happened recently, but its from late December...even so, I feel your pain.